AFC Rushden & Diamonds will be back in the Evo-Stik Southern League Division One Central for the 2017-18 season. Diamonds, who will start the next campaign by playing their home games at Kempston Rovers’ ground ahead of a proposed move to Hayden Road in Rushden, have been switched back having spent one season in the Evo-Stik Northern Premier League Division One South. 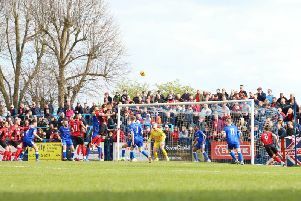 In the club allocations for Steps One to Four released by the Football Association at the weekend, Corby Town were placed in the Northern Premier League Division One South while Kettering Town remain in the Southern League Premier Division. All divisions will be officially rubber-stamped at the leagues’ annual meetings over the next few weeks. Southern League Premier Division 2017-18: Banbury United, Basingstoke Town, Biggleswade Town, Bishop’s Stortford, Chesham United, Dorchester Town, Dunstable Town, Farnborough, Frome Town, Gosport Borough, Hereford, Hitchin Town, Kettering Town, Kings Langley, Merthyr Town, Redditch United, Royston Town, Slough Town, St Ives Town, St Neots Town, Stratford Town, Tiverton Town, Weymouth. Southern League Division One Central 2017-18: AFC Dunstable, AFC Rushden & Diamonds, Arlesey Town, Ashford Town (Middx), Aylesbury, Aylesbury United, Barton Rovers, Beaconsfield Town, Bedford Town, Cambridge City, Chalfont St Peter, Egham Town, Fleet Town, Hanwell Town, Hartley Wintney, Hayes & Yeading United, Kempston Rovers, Marlow, Moneyfields, Northwood, Thame United, Uxbridge. Northern Premier League Division One South 2017-18: Alvechurch, Basford United, Bedworth United, Belper Town, Carlton Town, Chasetown, Cleethorpes Town, Corby Town, Gresley, Ilkeston, Kidsgrove Athletic, Leek Town, Lincoln United, Loughborough Dynamo, Market Drayton Town, Newcastle Town, Peterborough Sports, Romulus, Sheffield FC, Spalding United, Stamford, Stocksbridge Park Steels.